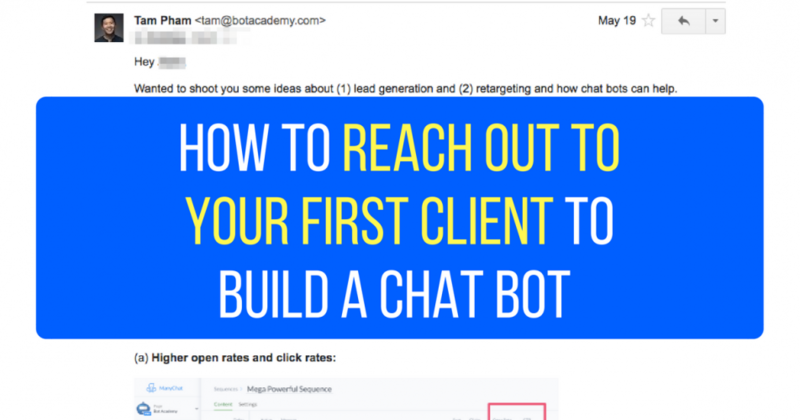 At Bot Academy we’re always telling you to contact potential clients about chatbots, but what happens when they tell you they’re interested? How do you get them to commit to buying? In past posts, you learned why entrepreneurs and marketers cannot ignore chatbots in 2017. You learned how to build your first chatbot. You learned the practical use cases chatbots can have for marketing. You learned how Ezra Firestone generated $20,669 in his first 30 days of using chatbots. We want you to use your chatbot super power to sell as a service to businesses who need this. This piece will cover how you can sell your skills as a service to businesses. This is nothing new if you have been in the marketing space for a while. You want to show how your super power can provide immense value to their company so that it is a no brainer for them to work with you. Below is an email I sent off to entrepreneurs to make them say yes to working with me. Feel free to edit, copy and paste, and do whatever you want with this email. Wanted to shoot you some ideas about (1) lead generation and (2) retargeting and how chatbots can help. High level strategy: We will create a funnel on Facebook Messenger that teaches potential customers [INSERT COMPANY GOAL]. This chatbot will drip messages to the user every X number of days to give value, build trust, and eventually make the sale. This is just an email marketing sequence, but through Facebook Messenger. Why should you care? (a) Higher open rates and click rates: We have been seeing 80% open rates and 50% click rates on our chatbot sequence and the students we teach [or the clients we help]. Yes, you read that sentence right. It’s that high because 1. we are early to the game and marketers haven’t ruined this yet. 2. it’s fun, novel, and engaging! (b) Much bigger opportunity to gain subscribers: More on this below. (c) More opportunity to have a conversation with potential customers and close sale: This is basically inside sales, but on messenger, where more people are likely to interact with you because texting is low friction and a sticky habit. More on this below. Now let’s get into real examples. This is the data from our [Bot Academy] bot. Can you imagine users going through your 10-day sequence EXCITED and ENGAGED? When done correctly, your customers will be raving to buy your product after you delivered so much value. There’s many steps involved to gain an email subscriber that we can reduce heavily with Facebook Messenger. With one click… your Facebook Page can instantly send your user a lead magnet. No typing email, clicking submit, going into Promotions tab, confirming. Plus you get access to (1) first and last name (2) school (3) work – all when they subscribe to your Messenger Bot. This blew my mind. 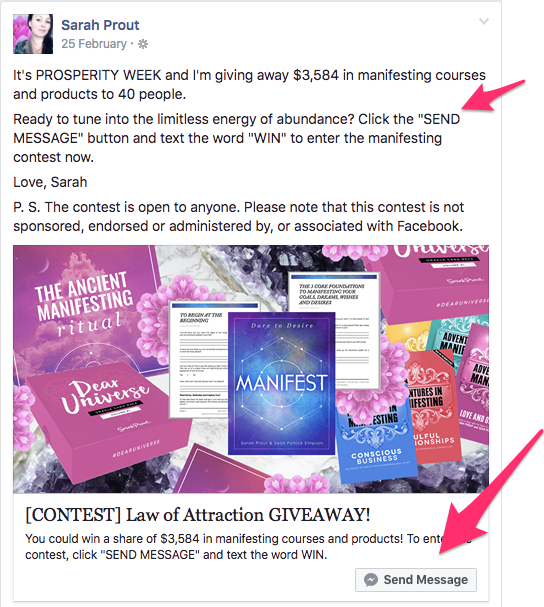 You can literally generate leads when someone COMMENTS on your Facebook Post. 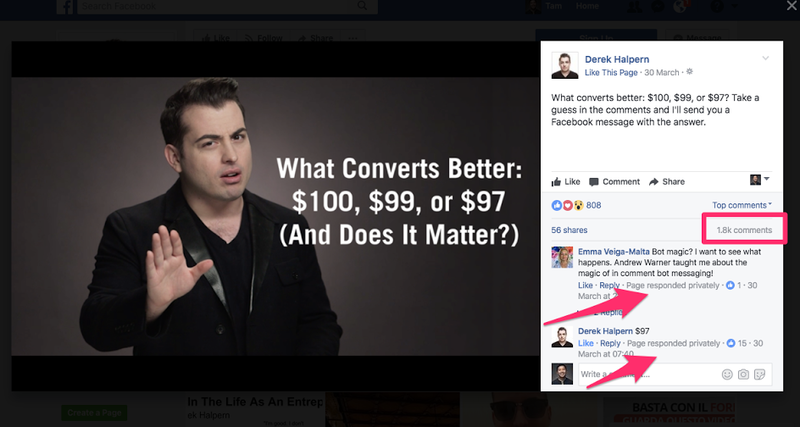 Derek Halpern gained 2k subscribers with 1 Facebook Post. 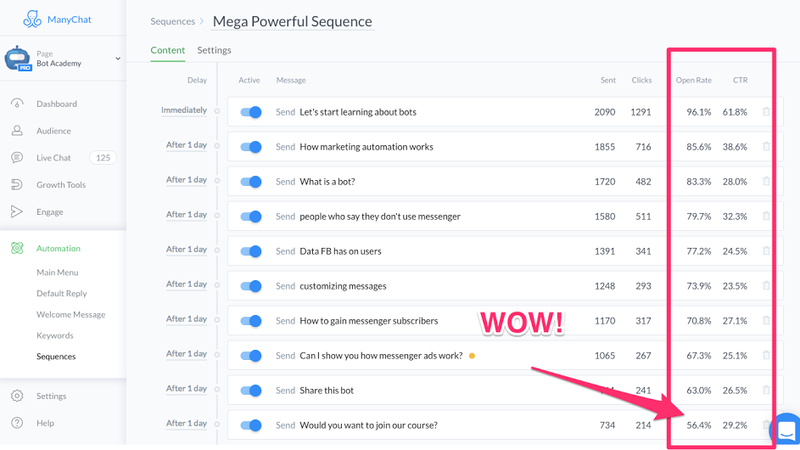 After user comments, your messenger chatbot sends them a message and subscribes them to your sequence. This is great for retargeting leads who abandon cart or visited your website in the last 90 days. This is the one-two punch for the Facebook ads. You can trigger your Messenger sequence so that if user clicks a certain button, your Facebook page will notify you in Messenger or email that someone clicked that button! For example: Every time someone has a question, they click the button and the admins are notified. 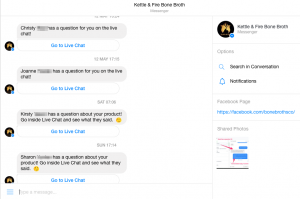 Your team can jump into live chat while they are on Facebook Messenger, close the same, all because you were at the right place, right time, to help the customer. I see so many practical applications where [COMPANY] will thrive. Would you like to talk more about how we can implement chatbots into your business? Make the email as personalized and specific as possible so the client can actually envision themselves having their own chatbot. Good luck landing your first chatbot client!